How to draw Anime Miku Vocaloid. This drawing video tutorial shows you how to draw Anime girl, Miku from Vocaloid. You can learn how to draw Anime, Manga, and comics in this website. Learn to draw with tips from a professional concept artist, me. You can scroll down further to see step by step images with instruction. Drawing Manga, Comics or anything could be easy if you simplify the complexity of the subject. When you see a figure in different poses, try to capture the main body or the most noticeable part first. Then simplify the shape of the main idea into a big simple geometry shape. Then move on to the next part and do the same for the rest. It is very useful if you can look at any subject and able to break it down into simple form. It can be very good observation exercise for artists. It is a lot easier to draw once you observe the over all shape of the object or person you are trying to draw. I usually start of using sphere or circle as a base for character’s skull, then next whatever shapes or forms that fits into part of the image. What is Vocaloid? Vocaloid (ボーカロイド) is a singing synthesizer application, with its signal processing part developed through a joint research project between the Pompeu Fabra University in Spain and Yamaha Corporation, who backed the development financially—and later developed the software into the commercial product “Vocaloid”. The software enables users to synthesize singing by typing in lyrics and melody. It uses synthesizing technology with specially recorded vocals of voice actors or singers. Who is Miku? Crypton had the idea to release Miku as “an android diva in the near-future world where songs are lost.” When KEI illustrated Miku he was asked to Miku as an android and her colours (based on YAMAHA synthesizer’s signature blue-green color). Also Crypton gave him her detailed concepts, however, Crypton says it was not easy to explain what “Vocaloid” is like to KEI and KEI says he could not have an image of “singing computer” at first as he did not even know what “synthesizer” is, and it took more than a month. The digital design on Miku’s skirt and boots are based off synthesizer program colours and the bars represent the actual bars within the program, following Crypton’s idea. 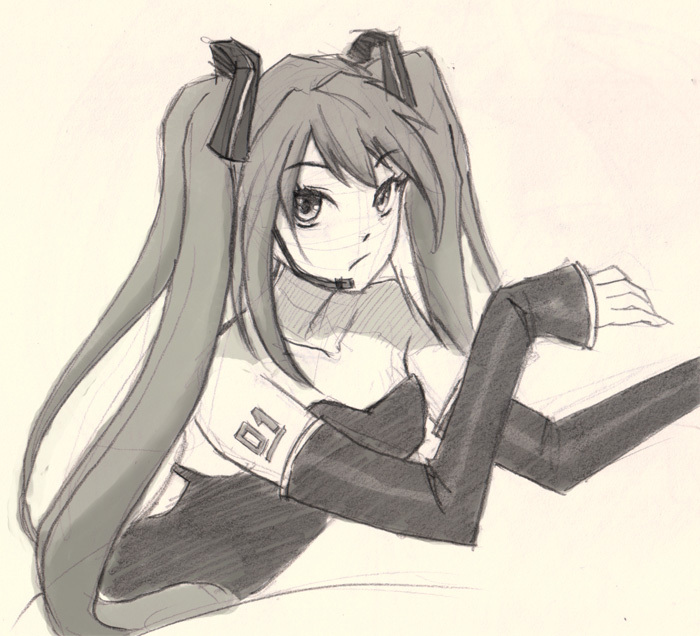 Miku was originally intended to have a different hairstyle, but KEI stuck to pigtails after trying them out. 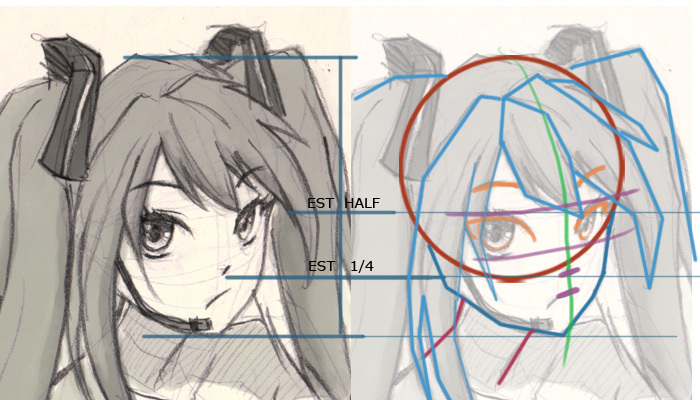 Below is a construction break down sheet for easy drawing of Miku face. Also step by step tutorial images to compliment the Manga drawing video tutorial. In 1-3) I am just drawing really light construction lines to get the overall shape of the subject (Muki). When first start drawing something, do not worry so much about adding little detail in the beginning, try to get the most accurate big shape of the subject you are drawing first. 4) Once you have construction line cover the overall shape, then you can add in eyes, nose, mouth, and hair using existing construction line you already have as base. There are vertical line and horizontal lines to establish the facial structure as instruct on the video tutorial. 5-7) Now we can start to see her face forming in the accurate facial structure of Miku. Then, I try to get everything in place as much as possible. Drawing is more about getting your lines in the accurate position and proportion, not about adding more detail. Good drawing always come from great foundation, accuracy and correct proportion. If you follow the instruction correctly, now you can just go ahead and draw the final darker lines over the sketch. If you did not get the result you want, check your placement of body part for its accuracy or proportion. Me? No, I have been doing this professionally for over ten years. Simple stuff I do not need reference or set up. Just go to a lot of life drawing classes to build up your visual memory of figures that is all. Something more complex, I will need ref. Awesome tutorial! Do you think this could be applied to Kagamine Rin? This website is fantastic.I would like to introduce this nice website to my friends. Thank for share!